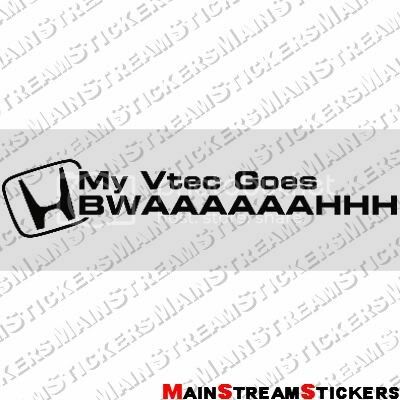 That's not because of vtec kicking in, it's because race car! TunerStickers - All Stickers Just $1 Plus Shipping - Unbeatable Prices, Top Quality, World Wide Shipping! Hahahaha yes! It sounds comparable to my buddy's straight pipe exige. I actually got pulled over on the way to work today, but the cop was cool and I just showed him what happened. And yes, it's a replica, but don't let this deter you from buying one. It just needs retaining springs or a nut and bolt and I'm good to go. I HATE hytech replicas. They're such junk. I threw mine away. After a couple rounds of it blowing apart or separating because you had to choose between a dead raccoon or the front of another car, you'll learn to either have it welded up, or get a different header. Without a traction bar system to give yourself more clearance, you'll likely go with another header lol. Mine separated at the collector about six times. The first couple happened when the exhaust scraped going up a driveway, the others happened because of debris/carcases in the road. I HATE hytech replicas. They're such junk. I threw mine away.